SkullConduct uses the bone conduction speaker and microphone readily integrated into the eyewear computer and analyses the characteristic frequency response of an audio signal sent through the user’s skull. Credit: Stefan Schneegass, et al. (Tech Xplore)—There are things that are unique about you—and researchers are eager to turn those things into identification tools. They are even listening to the unique sound of the person's skull. To be sure, researchers are going after alternative ways to confirm user identification. The arsenal of biometrics tools is filling up with new concepts based on physiological features. Back to the sound of your skull: One approach now being studied is something called SkullConduct. Namely, reported New Scientist on Thursday, SkullConduct "picks up on the unique way a sound wave changes as it passes through the bone in an individual's skull." The team involved in the effort are researchers at the University of Stuttgart, the University of Saarland and the Max Planck Institute for Informatics in Germany. The team will present their work at the Conference for Human-computer Interaction in San Jose next month. 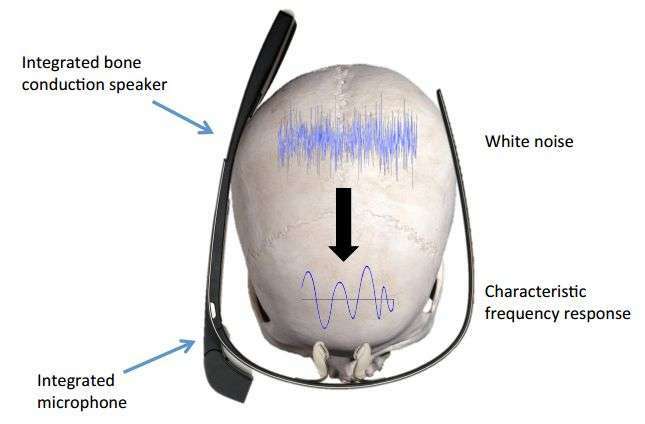 Their paper, "SkullConduct: Biometric User Identification on Eyewear Computers Using Bone Conduction Through the Skull," described SkullConduct as "a biometric system that exploits the characteristic frequency response of the human skull for user identification and authentication on eyewear computers equipped with bone conduction technology, such as Google Glass." Gizmodo described what would happen with wearable computers such as Google Glass or VR goggles. These would use an integrated bone conduction speaker to blast an ultrasonic signal into the wearer's skull. "A microphone on the device would then record exactly how that signal sounded after bouncing around inside someone's head, and the unique results could then be used to authenticate an approved user." New Scientist said bone conduction speaker and microphone in the study were used to propagate and receive an identical sound wave through the skulls of 10 persons. Sky News said the headset used two bone-conducting plates sitting on the cheekbones next to the ears. "The idea is basically to use bone conduction speakers and microphones to listen for tiny differences in how sounds bounce around inside people's skulls," said The Washington Post on Friday. The authors said they designed a user study "to record characteristic frequency responses for multiple people wearing Google Glass in a controlled laboratory setting." Results: The team was able to use the tiny differences in the sound waves after they passed through the participants' skulls to identify individuals with 97 per cent accuracy, said New Scientist. A 97 percent identification rate was impressive though one should also note the tests involved only ten participants. Also, their test of the prototype was conducted without background noise; accuracy might be affected in real scenarios. Also, the authors took into account that the "current system also uses white noise as the sample sound wave, which users may find irritating. But, according to New Scientist, "this could be replaced with a short music clip or jingle." What would the digital life be like if this were to come out of the research stage? Andrew Liszewski, Gizmodo, said, "The system could be built into smart glasses like Google Glass or VR headsets to log people into an account as soon as they don the device." Imagine where one day, simply holding the phone against your head, he said, could be used to unlock it, verifying you as a user.